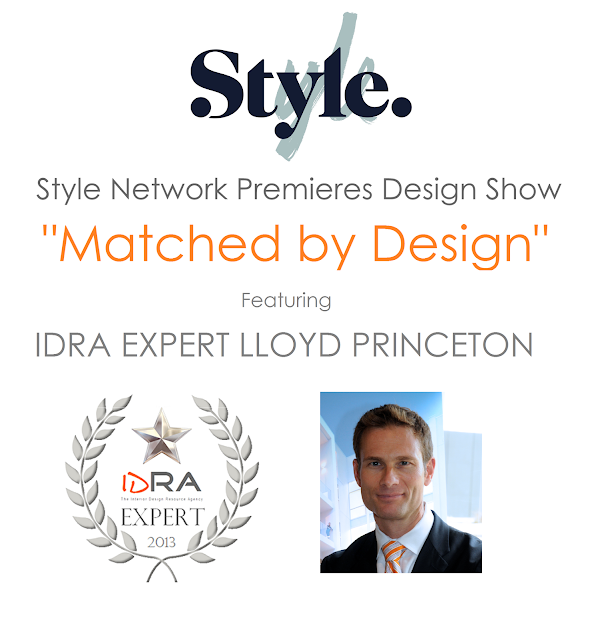 IDRA - The Interior Design Resource Agency, the global leader in business information and resources for interior architects and designers in over 60 nations, is pleased to announce that Style Media Premieres "Matched By Design", an all-new competitive interior design show" featuring IDRA Expert Lloyd Princeton. WASHINGTON, DC - August 15, 2013 - Style Media debuts an all-new half-hour home makeover special introducing IDRA - Interior Design Resource Agency Expert Lloyd Princeton, a high-end interior design broker, who matches clients with A-list designers. Princeton's matchmaking process involves selecting three designers to present their unique vision for the client’s renovation. The client then makes their choice with Lloyd managing the project and, ultimately, the fabulous final reveal. "Matched by Design," airs Tuesday, August 20 at 10pm ET/PT, as Princeton introduces clients, Grammy-winning producer Tricky Stewart and his wife, to three interior designers- Charles Neal, Julia Wong and Jessica Bennett - who must compete to make over their guest bedroom and bathroom. Each designer presents concepts to the homeowners who decide which design best articulates their aesthetic and personalities. However, the Stewarts begin to question their choice when the selected designer doesn't adhere to their timetable and budget. "I'm very excited and proud to see Lloyd making a quantum leap into television. He's extraordinarily smart with exceptional competency in business." V. Carr, Managing Director of IDRA was quoted as saying. "My entire office is buzzing with excitement and personally I'm thrilled for him and looking forward to seeing him on the screen." Those interested in learning more about IDRA’s interior design business resources or its IDRA Experts can visit www.idratheagency.com. "Matched by Design" premieres Tuesday, August 20 and Tuesday, August 27 at 10pm ET/PT on Style Network and is produced by PB&J Television with Patty Ivins Specht, Julie Pizzi, Adam Ripp and Scott Cushing as Executive Producers. The Interior Design Resource Agency (IDRA) is the premiere operations and management consultancy for interior architects and designers with a design audience in over 60 nations around the globe. IDRA offers unparalleled business resources for interior design professionals with focused guidance and support on the operations and management aspects of the business. IDRA's vast resource library includes literary and multimedia resources that address contracts, marketing, public relations, organizational structure, accounting and more. Additionally IDRA has a global network of estimable experts with extensive experience in their respective disciplines and have shown excellence in their areas of expertise. The IDRA Diplomatic Corps serves local design communities through IDRA Ambassadors and by creating local chapters to support designers at the municipal level. Find IDRA on the web at www.IDRAtheAgency.com and on Twitter at https://twitter.com/IDRAtheAgency. Great blog you people have maintained there, I totally appreciate the work. Contact to mn web design if you need design a website. Good lucky! hi my friend, I'm web designer in Minnesota. I followed you on twitter!